Samuel Austin Allen arrived in Joplin in 1890 at the age of 10. His father was J.W. Allen an early pioneer and successful mine operator in the area. Austin graduated from Joplin High School in 1898. He received a degree in architecture at the University of Pennsylvania in 1902 and later went to Paris where he pursued his interest in architecture. Returning to the United States Allen became associated with Bruce Price of New York, one of the foremost architects in the United States. After two years in New York he returned to Joplin to begin practicing his craft in 1905. Allen was an extremely successful architect with offices in Kansas City and in the Frisco Building in Joplin. His professional Joplin resume included such handsome structures as the Newman Building, Saint Peter’s Catholic Church, Olivia Apartments, Joplin High School, United Hebrew Temple, Elks Lodge, and many impressive homes. Mr. Allen was a member of the American Institute of Architects. His obituary in their journal noted, “that his work was marked by a “chaste dignity and scholarly restraint.” Mr. Allen married Belle Taylor and had three children. 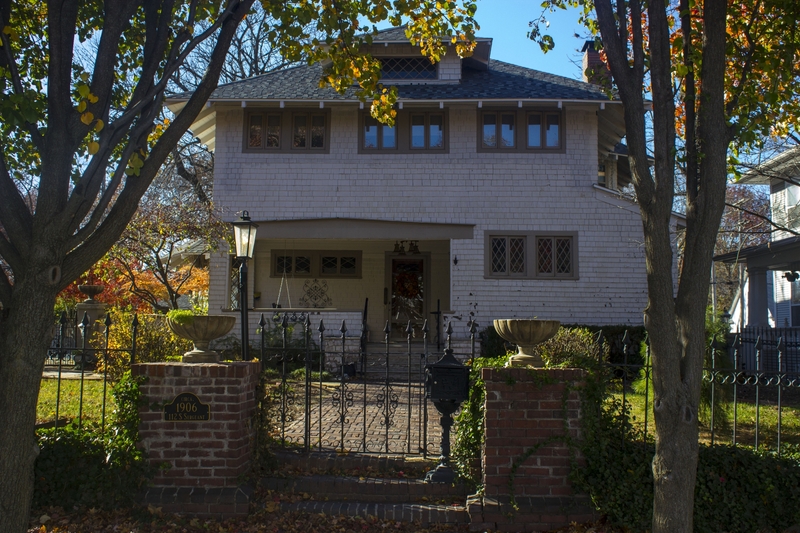 The Arts and Craft movement the heavily influenced Austin Allen when he designed his home in 1905, for it clearly reflects the movements principals, beautiful materials and honest craftsmanship. Prominent feature in the home include the rich polished wainscoting. Curved built-in window seats, massive brick fireplace and leaded glass bookcases. The most impressive feature however is the elegant coffered ceiling, reminiscent of the homes of the English Tudor and Jacobean periods. The Allen Mausoleum is located at Mount Hope Cemetery. 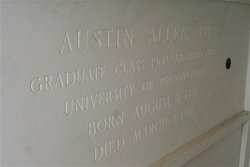 Inside Allen’s mausoleum is a resolution from the Kansas City Chapter of the American Institute of Architects. Several family members interned in the mausoleum. The mausoleum architecture features solar disks between the pair of falcon wings at the very top. It represents the sun god, Re and rebirth. Mr. Allen married Belle Taylor and had three children. He died at the early age of thirty-six from typhoid fever.